Practice the questions given in the worksheet on pictograph and bar graph. 1. Make a pictograph to show the mode of transport used by children to come to school. Use a ‘car’ to represent 50 students. (i) How many runs did the player score in the year 2003? (ii) What is total runs scored by him? (iii) What is the difference between his highest and lowest yearly score? 3. The marks scored by Ravi in the different subjects is given below. Represent this information by a bar graph on a graph paper. (i) Which two children have the same weight? (ii) Whose weight is the least? (iii) Whose height is maximum? 5. In a hundred metre race the time taken by 5 people is given below. Represent this information on a bar graph. 6. Draw a pictograph to represent the following data, use a square to represent 50 students. 7. 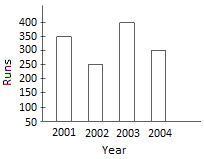 Draw a bar graph for the following data. Answers for the worksheet on pictograph and bar graph are given below.